First, millionaires currently pay an average effective tax rate of 25 percent, while the average taxpayer pays 11 percent, according to the most recent IRS data. But these are the averages, and the rates certainly vary depending on the combination of deductions, credits, exemptions, preferential rates, etc. So, the simplest approach would be to eliminate these so-called loopholes, right? Warren Buffett primarily takes advantage of the preferential rate on capital gains and dividend income, which is 15 percent versus a top rate of 35 percent on ordinary income. This largely explains why his effective tax rate is 17.4 percent on taxable income of $40 million. And it explains why a lot of millionaires pay less than the 25 percent average rate. So the straightforward debate is over the preferential rate on capital gains and dividends. Why does it exist? There is a moral reason and an economic growth reason. First, the economic growth reason is that taxing investment means we get less of it, and less investment means less capital formation, less innovation, and less productivity – all resulting in a lower standard of living. Try to imagine life without Apple. The moral reason is that it mitigates a pretty severe double-tax. Capital gains and dividends have already been taxed once, as corporate profits, at an extremely high rate of 35 percent (the highest in the developed world). What’s left is paid to shareholders as dividends or retained as earnings which create capital gains. So Warren Buffett vastly understates his tax bill by not including the corporate tax paid by his company, Berkshire Hathaway, which is presumably the source of most if not all of his investment income. The combined rate he pays on this income is about 45 percent (35 percent of profits plus 15 percent of the remainder). To illustrate, let’s assume Berkshire Hathaway were organized as a pass-through business, such as an S-corporation, which is taxed under the individual code, not the corporate code. That would mean Warren Buffett’s share of the profits would be “passed-through” as his personal income and taxed at the ordinary rate of 35 percent. Therefore, his effective tax rate would be very close to 35 percent, since there are no other plausible deductions or credits that would put much of a dent in his $40 million income. So the Buffett Rule would have the effect of further increasing taxes on investing in standard C-corporations, and create more incentives for the Berkshire Hathaways of the world to reorganize as pass-through entities. 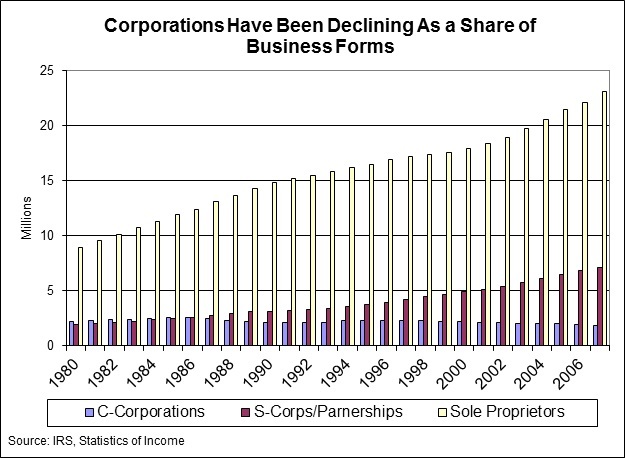 It is already the case that there are fewer C-corporations today than there were 25 years ago, as the following chart illustrates. 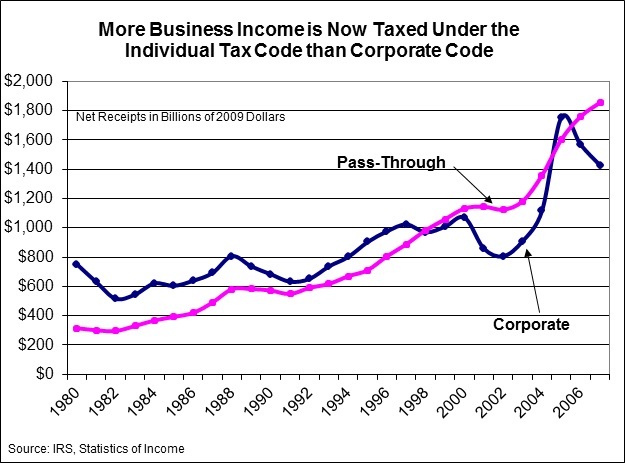 Likewise, more business income is now taxed under the individual code than the corporate code. The Buffett Rule would go further in this direction. One unintended consequence might be to sap the life out of publicly traded stock exchanges, and move the real action to privately traded shares. Know anyone that can do that for you? Not to worry, the world’s most successful investor probably has it all figured out.